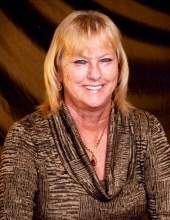 Mrs. Debra Kaye Graham Duncan age 63, passed away on Friday, November 23, 2018 at Brandon Regional Hospital in Brandon, FL following an illness. Mrs. Duncan was born on August 1, 1955 in Loris, SC, to Clayton Graham and Margie Virginia Small Graham Floyd. Mrs. Duncan was a homemaker and attended Kings Avenue Baptist Church in Brandon, FL. Survivors include her husband, Tony C. Duncan of Valrico, FL; father, Wayne Floyd of Loris, SC; two sons, Tony C. Duncan, Jr. and wife, Leslie and Dustin Duncan all of Geneva, FL; daughter, Layla Gioielli of Valrico, FL; four grandchildren, Jordan Bayles and husband, Matthew, Hayden Gioielli, Tony C. Duncan, III and Emily Duncan; three brothers, Ricky Graham and wife, Sherry of Loris, SC; Mike Graham and wife, Missi of Polk City, FL; Rodney Floyd and wife, Lisa of Simpsonville, SC and sister, Monica Floyd Wright and husband Terry of Loris, SC. Mrs. Duncan was predeceased by her mother, Margie Virginia Small Graham Floyd. Please sign Mrs. Duncan’s online guestbook at hardwickfuneralhome.com or call Hardwick Funeral Home at 843-756-7001 for further information. To plant a tree in memory of Debra Kaye Duncan, please visit our Tribute Store. "Email Address" would like to share the life celebration of Debra Kaye Duncan. Click on the "link" to go to share a favorite memory or leave a condolence message for the family.